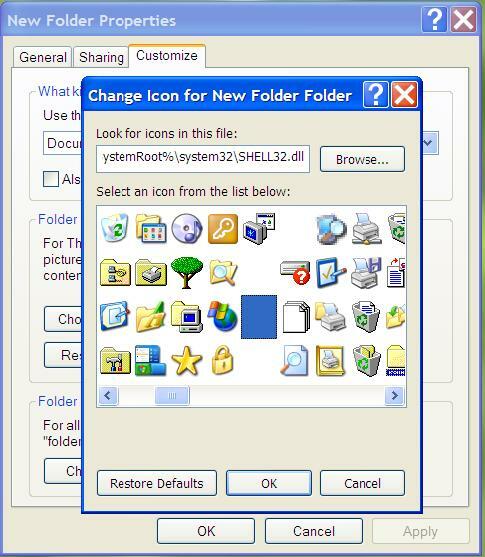 Most of the time you hide your folder in Windows XP using the Tools –>Folder Options –>View –> Do not show hidden files and folder radio button combining with the folder–> Right click–> Hidden Attribute . If you are little more serious about hiding your folder, most probably you are using a folder lock or folder hide software. Okay, most of this software serve your purpose. But do you know there is a tricky way to hide any folder in your windows operating system? To hide your folder first rename it using Alt and 0160 as the file name. You’ll notice that the file won’t have any name since alt + 0160 was used as the file name. Now go to the properties of this folder and select customise tab and then go to change icon. As an icon, select a blank icon as shown in the following picture. Put this folder at your desired place ( Hard drive location) and it will be hidden from others but you can access it pretty easily. This tips word for Win98/ME,Windows XP, Windows Vista/ 7. But keep it mind that, this is not a secured way to hide folder. With it you should not hide a folder you want absolute security.